Three words I never thought I'd hear uttered in the same sentence - "pom poms" and "fashion". Pom poms evoke for me imagery of high school cheerleaders, and really dodgy children's clothing that that poor someone in your year at primary / nursery school was made to wear by their parents. Never in my wildest dreams, did I think it would take off and go from novelty to serious fashion trend. But it has. And I'm not talking about pom pom bobble hats, pom poms on Christmas socks, or those pom pom key rings that are increasingly cropping up on bags. I'm talking full on pom poms. On jumpers, shoes, everywhere. At the end of last year, Topshop reported an 100% increase of sales of hats with pom poms on them. Those of you frequent to the ASOS website (guilty as charged! 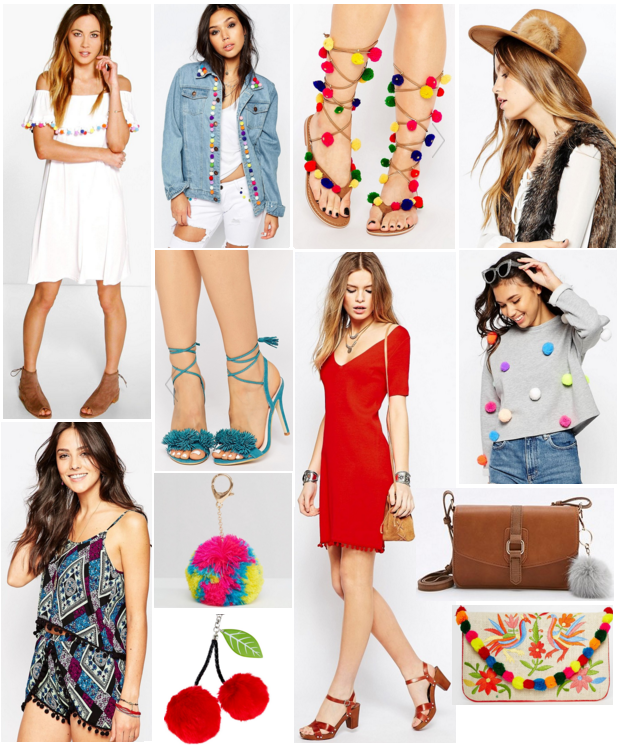 ), will notice that ASOS are stocking more and more shoes with pom poms on them. And the likes of Sophie Hulme have sent pom pom with googly eyes down the catwalk. Or failing that why not try some pom pom DIY? Hobbycraft sell lots of different colours here so you can stitch onto your clothing and accessories as you please! I especially love their blue pom poms and tie dye rainbow coloured ones. Having already ordered the white off the shoulder dress (above), next on my wish list is a a pair of lace up shoes which travel up the leg with some pom poms for added sass. How do you feel about the pom pom trend? I actually quite like this trend, it's really colourful too!